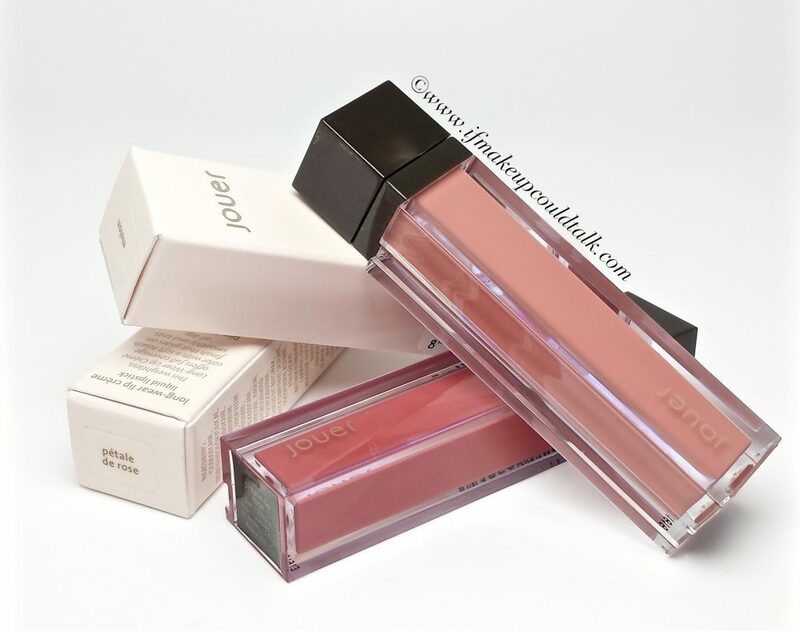 Jouer Petale de Rose and Melon Long-Wear Lip Creme. Personally, I know I really like a product when I cannot wait to purchase more colors from the line. 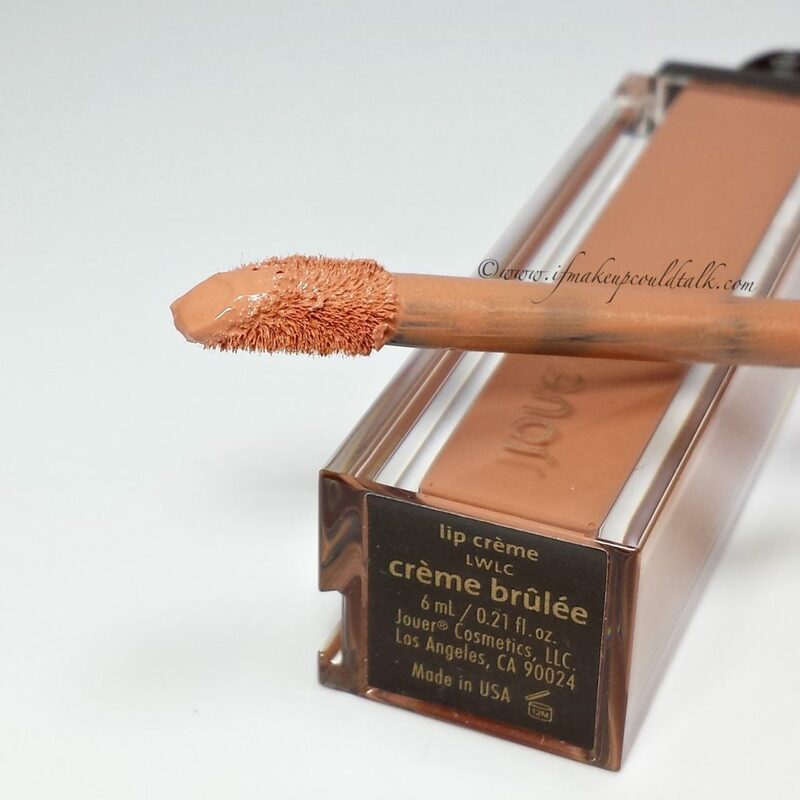 Such was the case with Jouer Lip Cremes. 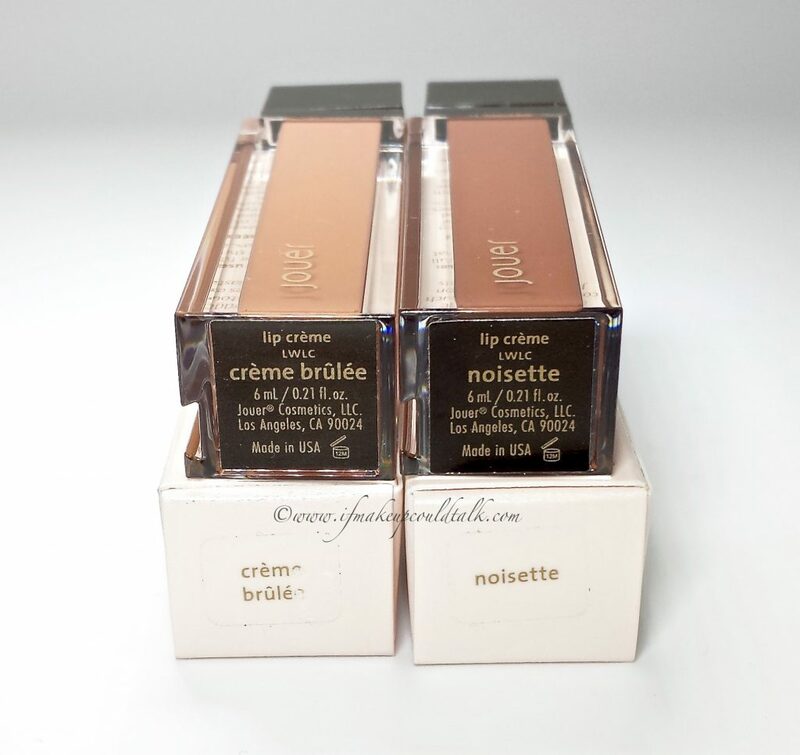 As expected, Creme Brûlée and Noisette (reviewed here) have been worn consistently since their acquisition a few weeks back. 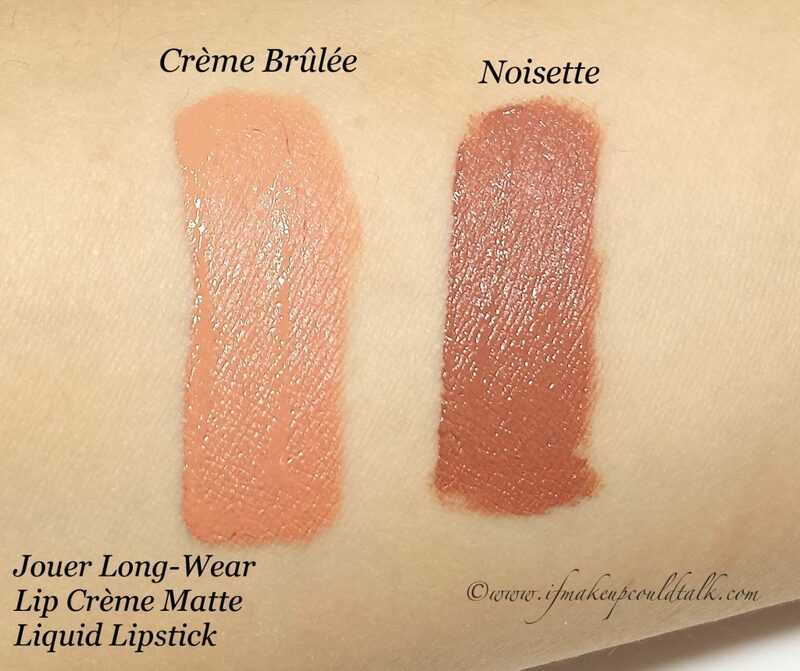 Naturally, when I received an email stating Jouer Petale de Rose and Melon Long Wear Lip Creme ($18 USD/ 6 mL) were back in stock, I immediately purchased them on the spot. My adoration for this formula is so palpable, all other liquid lipstick launches have been rebuffed and/or ignored–bold sentiment indeed. 🙂 I hope you enjoy. 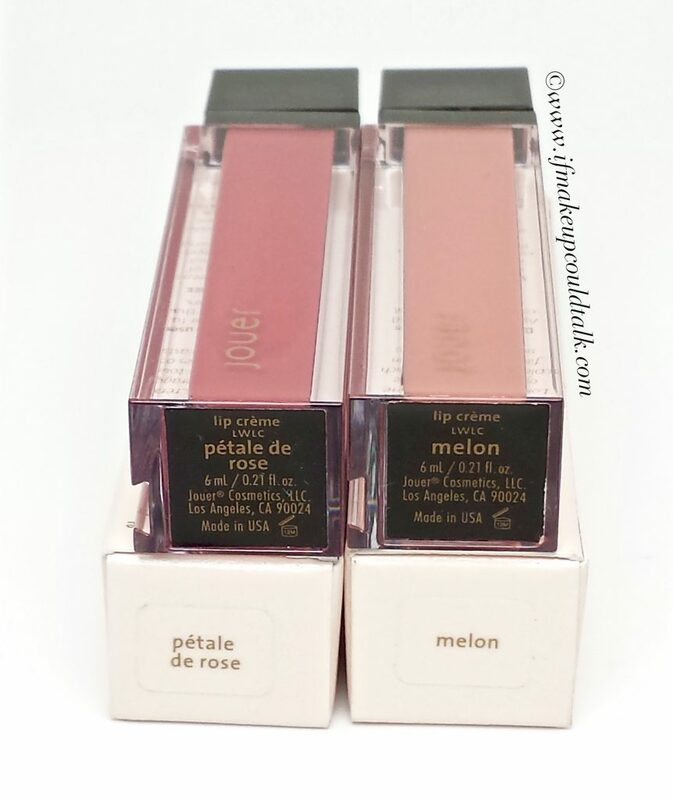 Jouer Petale de Rose and Melon Long-Wear Lip Creme ingredient list. 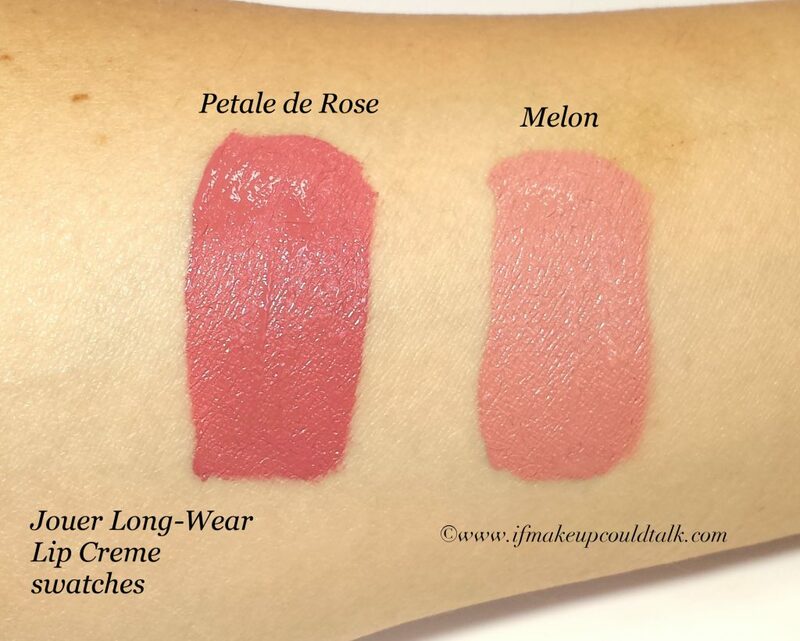 Jouer Petale de Rose and Melon Long-Wear Lip Creme swatches freshly applied. 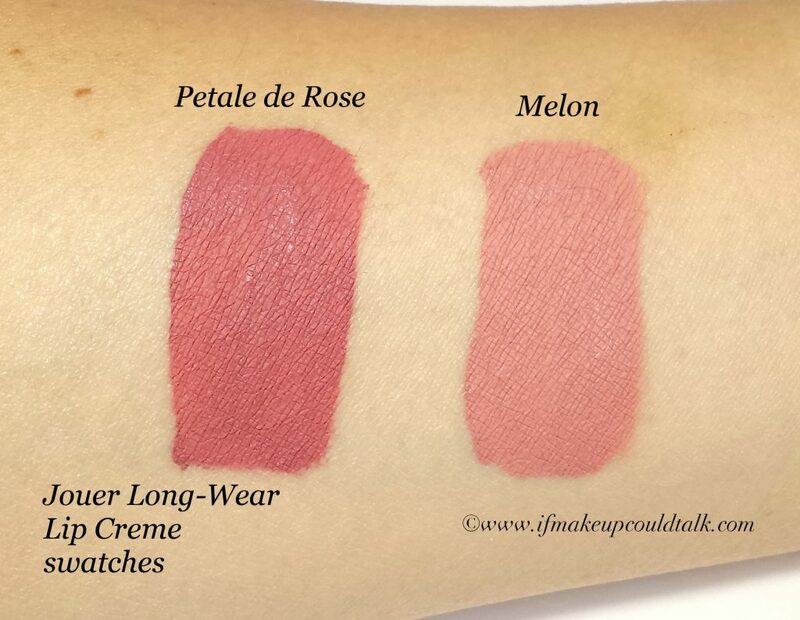 Jouer Petale de Rose and Melon Long-Wear Lip Creme swatches after two minutes. 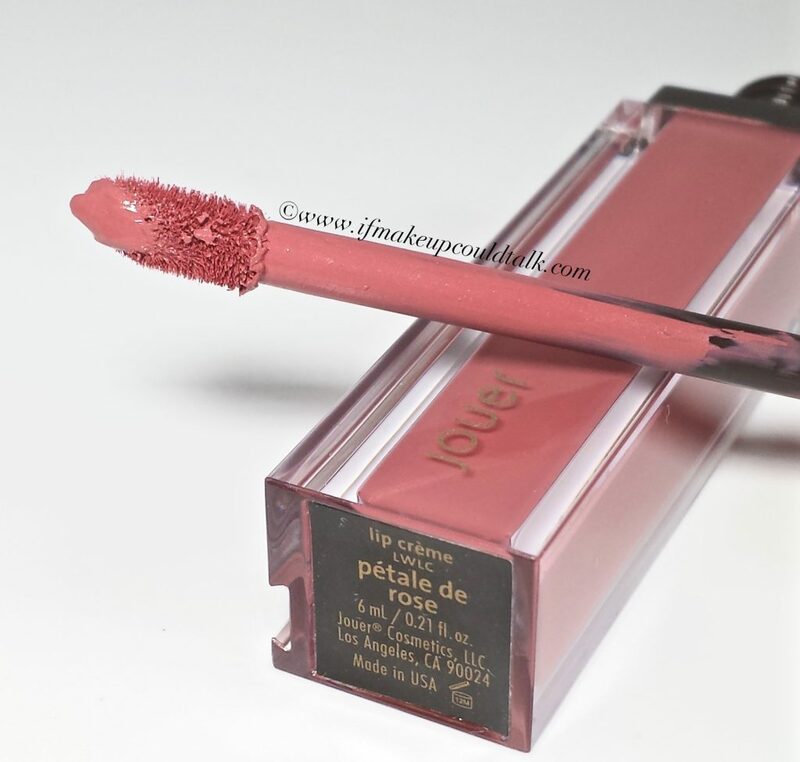 Jouer Petale de Rose Long-Wear Lip Creme. 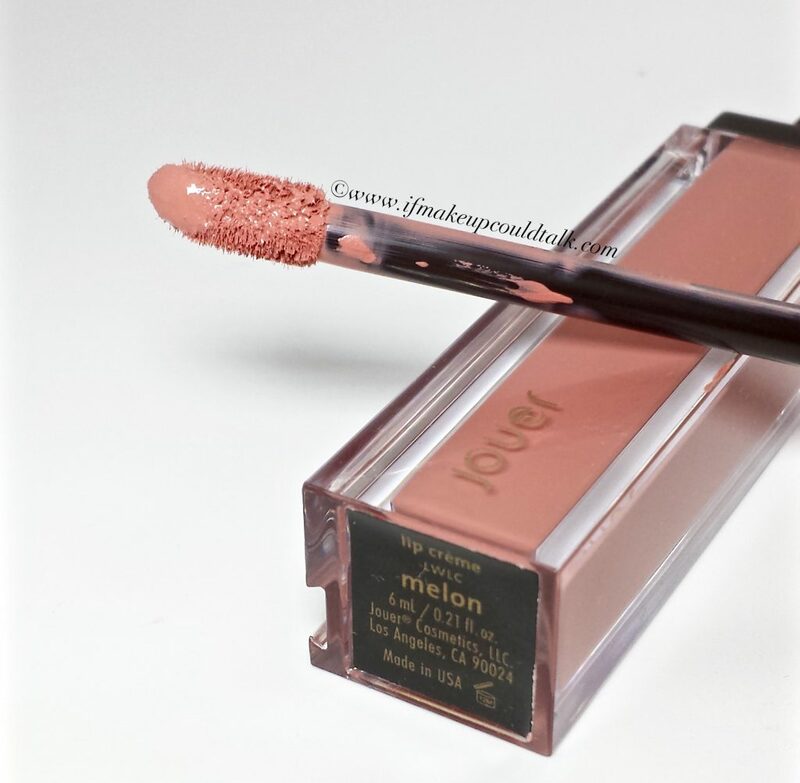 Jouer Petale de Rose Long-Wear Lip Creme lip swatch. 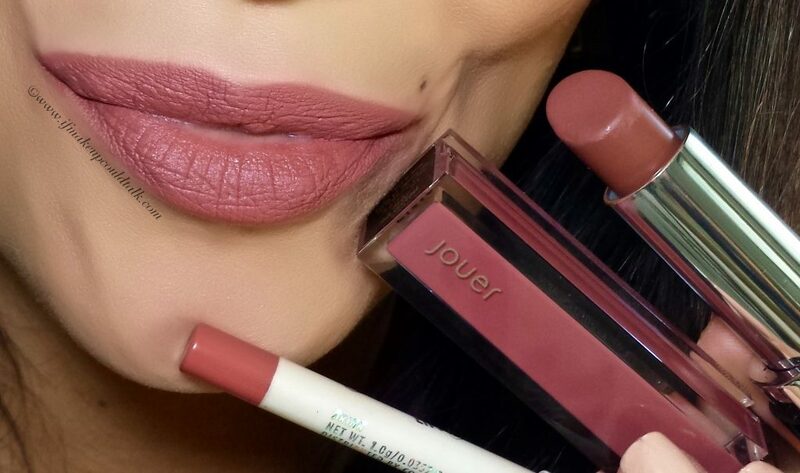 Jouer Petale de Rose with Colourpop Brink liner and lightly topped with Marc Jacobs J’Adore Le Marc lipstick. 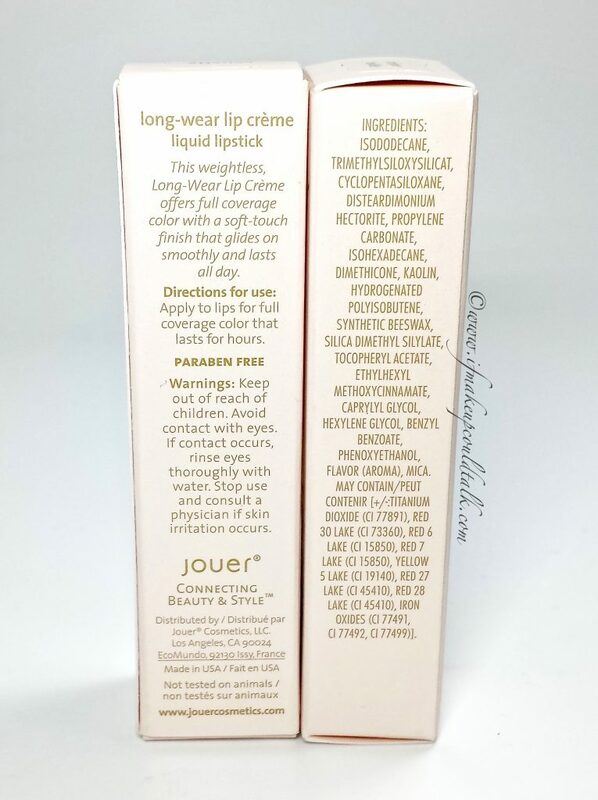 The formula of all the Jouer Lip Cremes that I have tried (four in total), are extremely smooth and creamy. 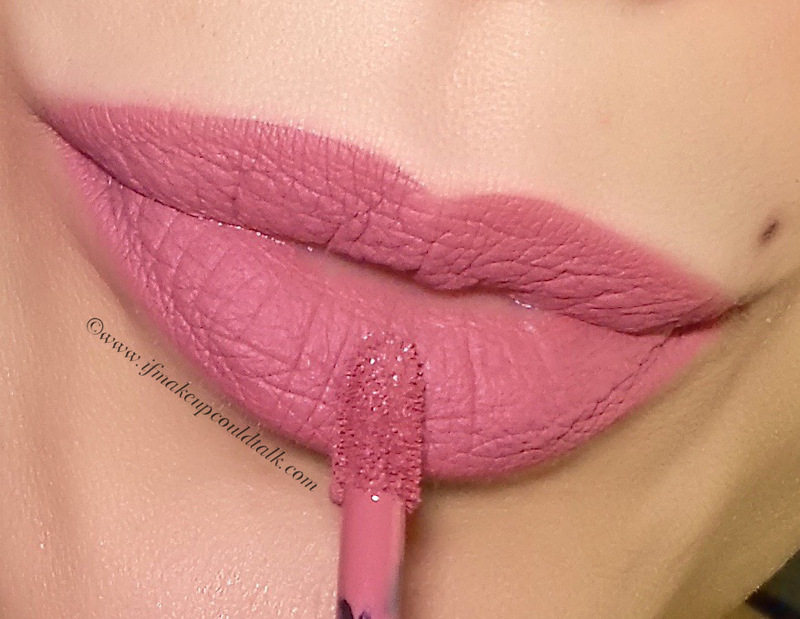 As you can tell, the color settles on the lips beautifully without looking caky or dry. Read a more in-depth review on the formula and wear time (here). Petale de Rose is, as the name would suggest, a dusty rose color. This was the one color I was so excited to receive. The shade seemed to be universally flattering, but to my surprise I was a bit disappointed with the way it looked against my coloring. 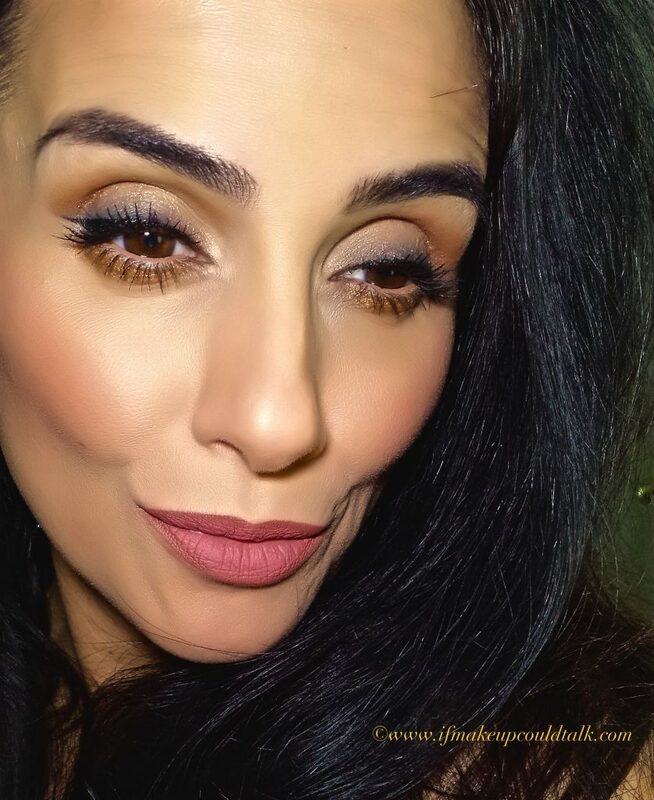 On my olive complexion, Petale de Rose translates to a dull pinky shade rather than a rich rosy hue. 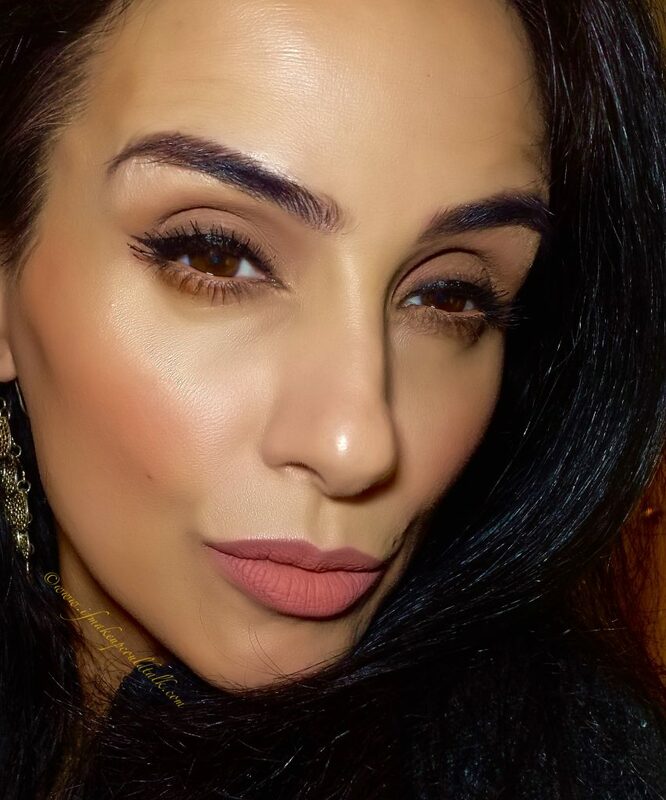 That is not to say, there is anything wrong with this color, in fact I believe many people will absolutely LOVE PDR–further proof of how colors can look differently on everyone based on skin tone and lip pigmentation. 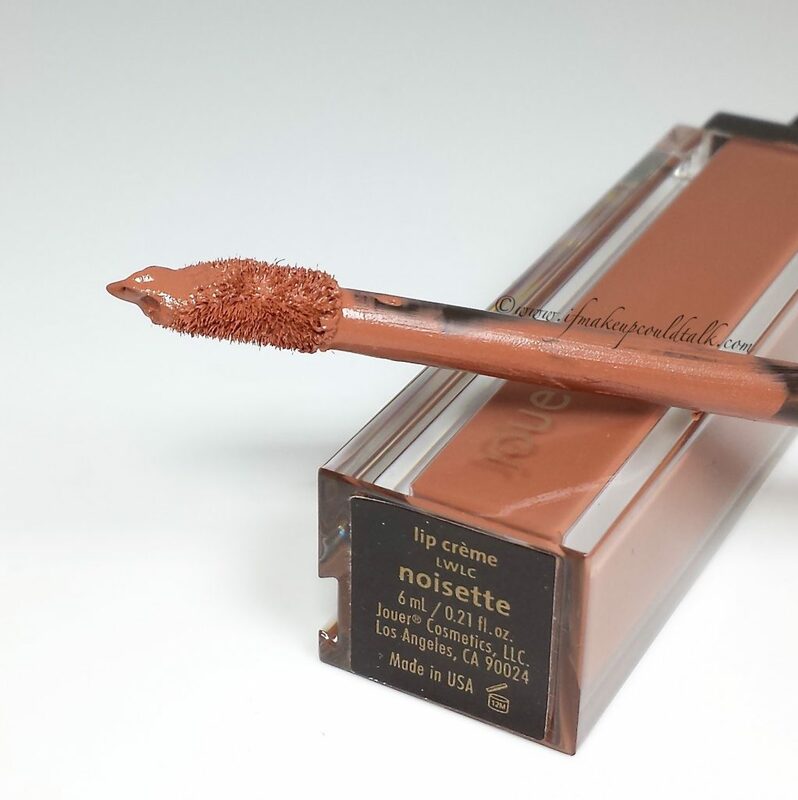 To make this shade more suitable for my taste, I tend to add a brown toned liner and/or lipstick. The resulting combo not only looks more flattering on myself, but I believe my concoction, in general, is more becoming on medium and darker skins. For the above combo, I lined and filled in my lips with Colourpop Brink Lippie Pencil and added one layer of PDR. As a final touch, Marc Jacobs J’Adore was patted over PDR–(FYI, should you decide to swipe J’Adore on instead, the feeling will be quite heavy and drying). 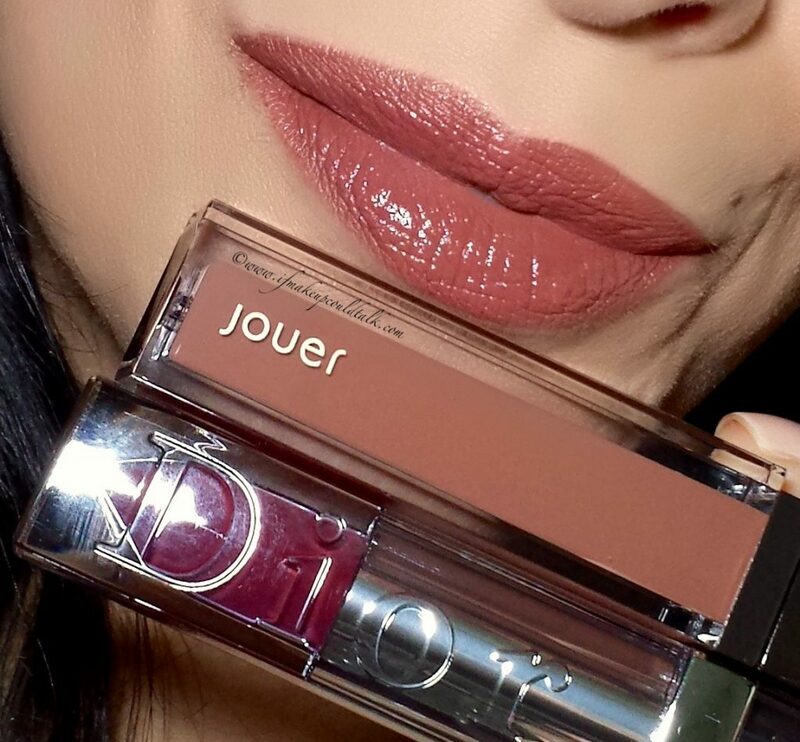 I could have used Jouer Noisette in place of J’Adore, but layering two liquid lipsticks will indubitably feel quite drying. Mixing the colors on a palette is the obvious solution, but admittedly, too much work on a daily basis. I believe, Petale de Rose would be perfect, on its own, for those with lighter complexion and/or eye colors. 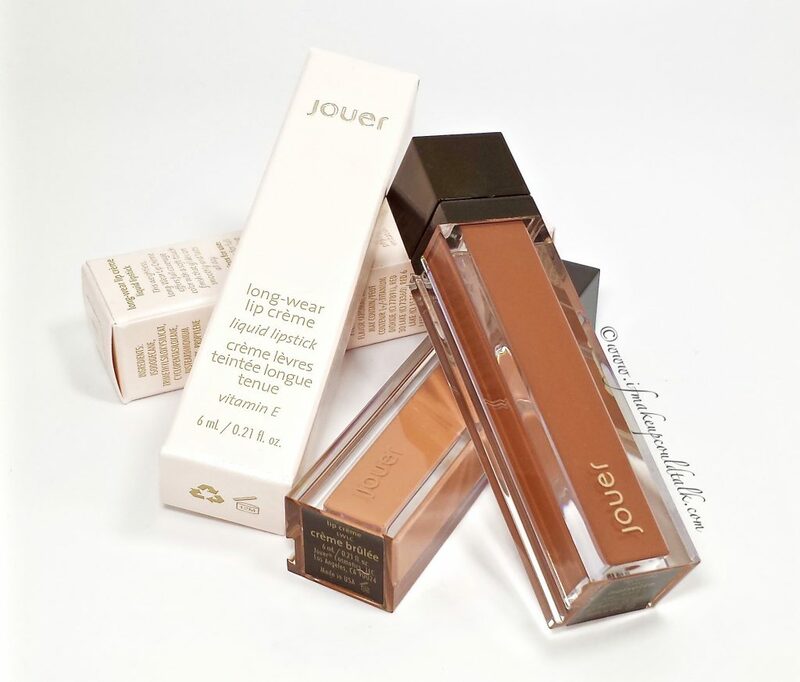 Jouer Melon Long-Wear Lip Creme. 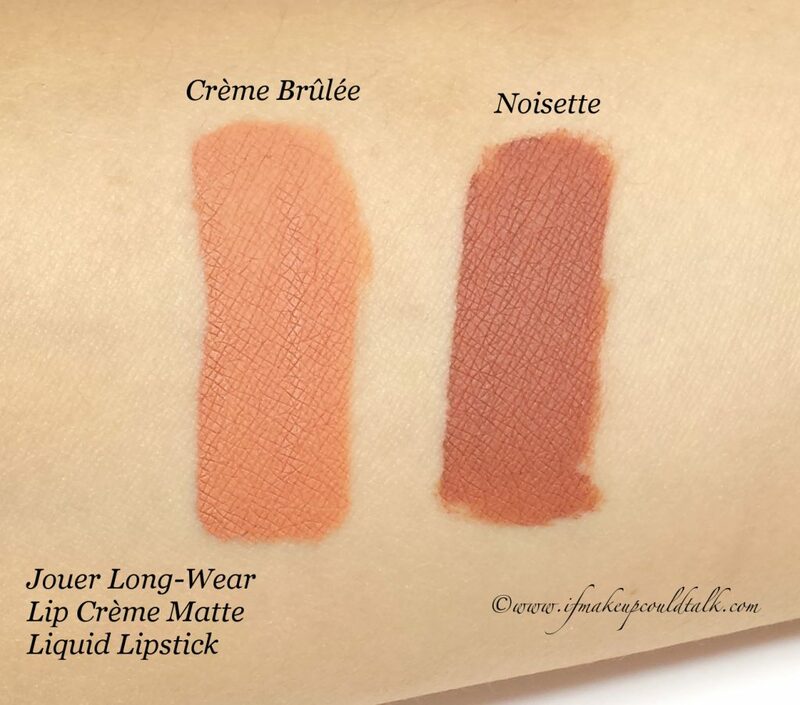 Jouer Melon Long-Wear Lip Creme lip swatch. 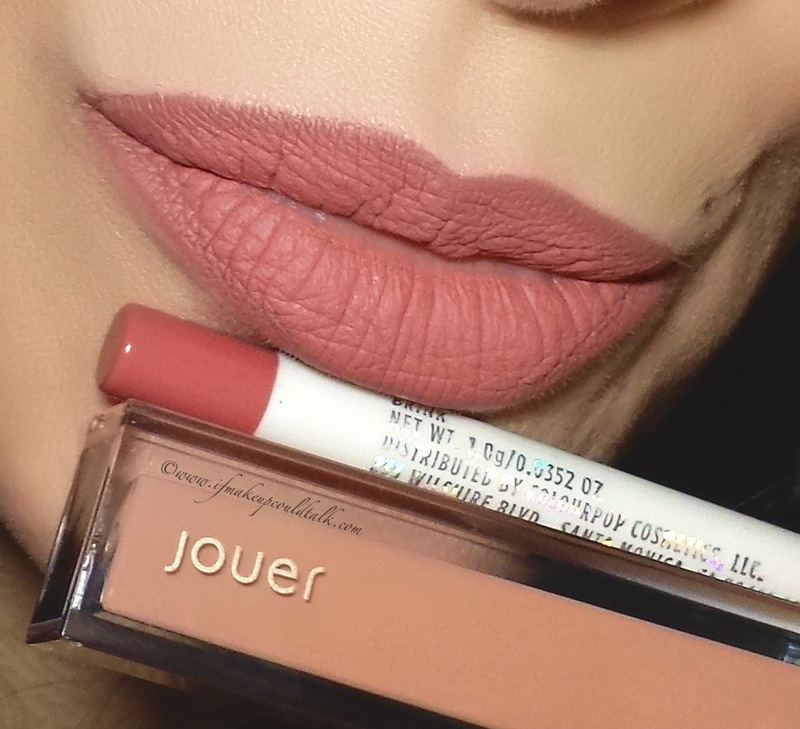 Jouer Melon Long-Wear Lip Creme with Coloupop Button liner. Melon is a beautiful warm pale pink shade. I was not expecting to like this color as much as I do. To my eye, the color contains a yellow base pigment, which adds a delicious warmth to an otherwise pasty shade. I will admit, like Creme Brûlée, this color can look quite chalky when worn on its own. I happily discovered pairing a brown based lipliner (Colourpop Button Lippie Pencil) transforms the milky tone into a more suitable hue for my complexion. 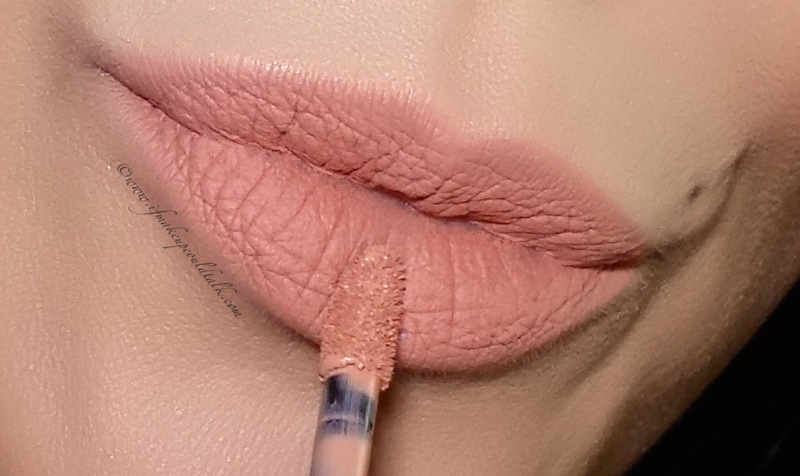 For the above combo, I lined and filled in my lips with Colourpop Button and added one layer of Melon and gently pressed my lips together to meld the two formulas. The resulting shade not only looks more wearable, but somehow the comfort level is elevated. I can easily sport this combo for up to six hours without the need for a moisturizing topper shade. Granted these results will vary, but I can confirm Colourpop liners, Dior Addict Fluid Sticks, Chanel Rouge Allure Gloss and YSL Kiss and Blush Babydoll pair perfectly with Jouer’s lip cremes for long-lasting, non-feathering results. FYI, lighter colors in general, can easily morph into different shades depending on the lipliner used. With that said, I can easily transform Melon into Petale de Rose simply by using a dark rosy tinged lipliner. Jouer Petale de Rose, Marc Jacobs Kiss Kiss Bang Bang, Jouer Melon, Jouer Creme Brûlée, Jouer Noisette, Dose of Colors Truffle, and Marc Jacobs J’Adore. 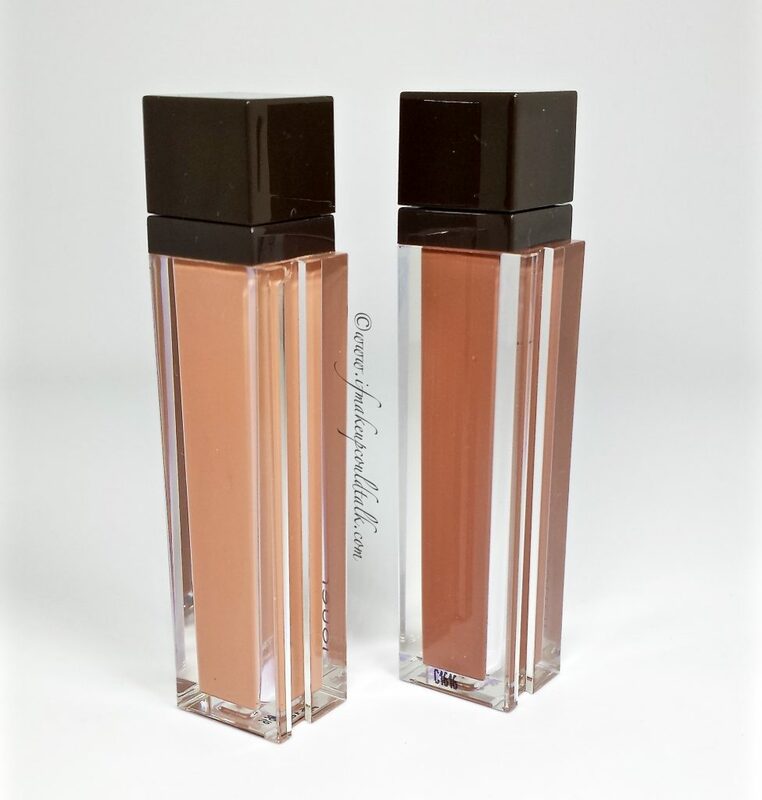 As you can tell, Jouer Petale de Rose and Marc Jacobs Kiss Kiss Bang Bang are so similar, one does not need to purchase both colors. I would say the main advantage the Jouer formula has over Marc’s Le Marc lipsticks is the non-transferable aspect–oh and the price. 🙂 I adore my Le Marc lipsticks and find KKBB to have a more brighten effect on my complexion, so in this insistence, I would choose Marc. 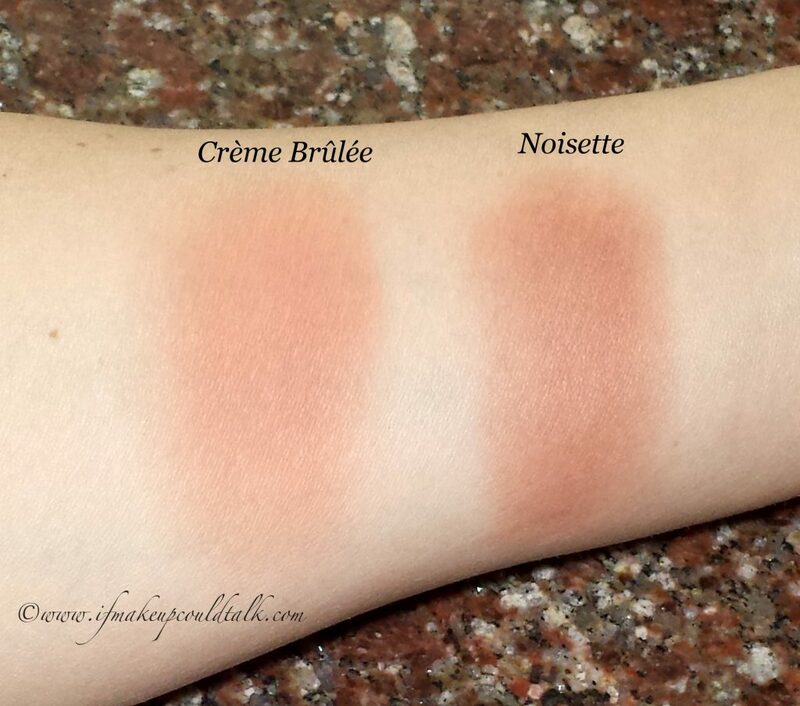 Jouer Melon and Creme Brûlée are both warm tone colors. Melon, to my eye, is the pinker version of Creme Brûlée. Both colors perform exactly the same, although I find Melon to be less patchy than CB. Regardless, I adore and use these types of colors everyday with a variety of other formulas and brands. As stated in my pervious review, Jouer Noisette and Marc Jacobs J’Adore are quite similar. Again, this is a matter of personal taste, with regard to comfort level, wear and price. Both colors are beautiful and serve their purpose in my collection. Dose of Colors Truffle (reviewed here) was thrown into the mix simply to show the neutrality of this particular shade. 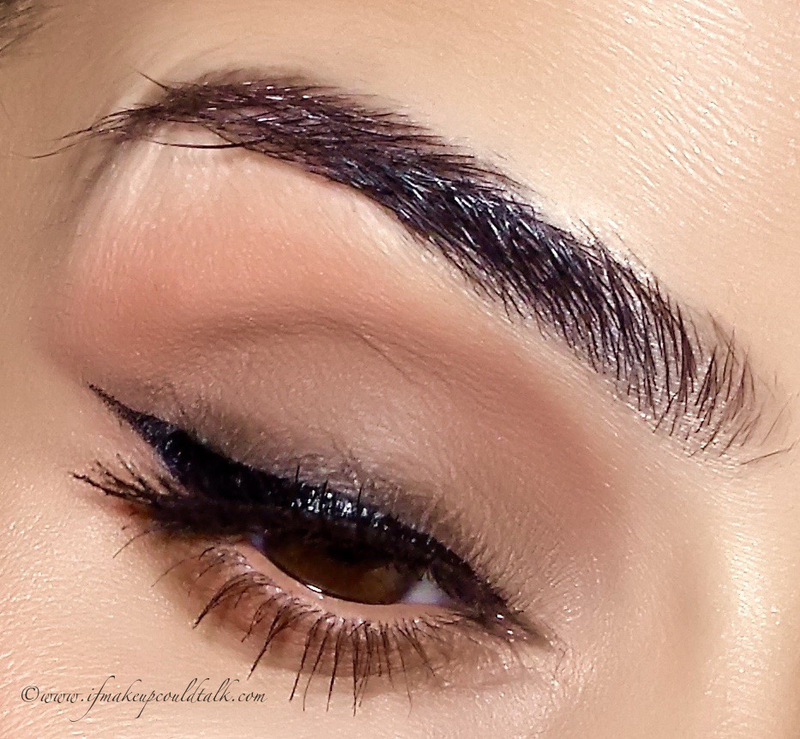 The pinky/brown color is flattering on so many complexions and does not need much coaxing to work. 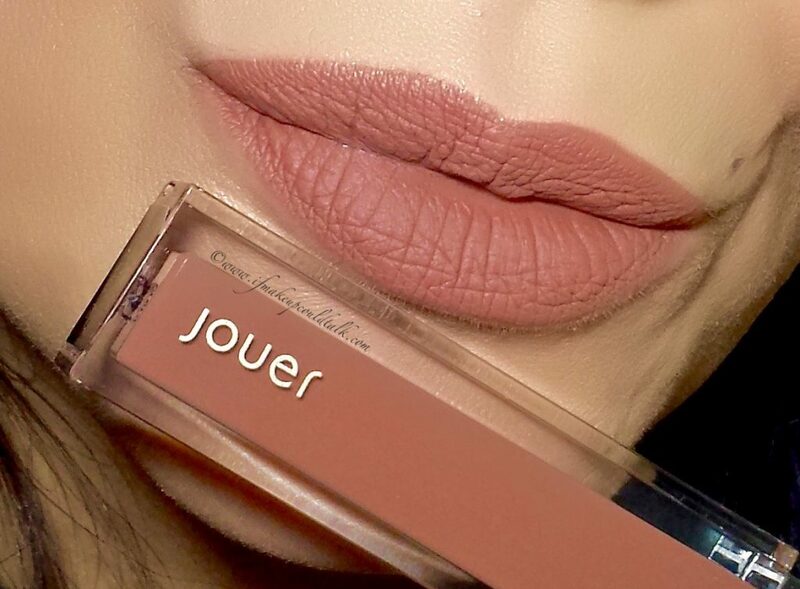 My fondest wish is for Jouer to come out with a shade similar to Truffle. 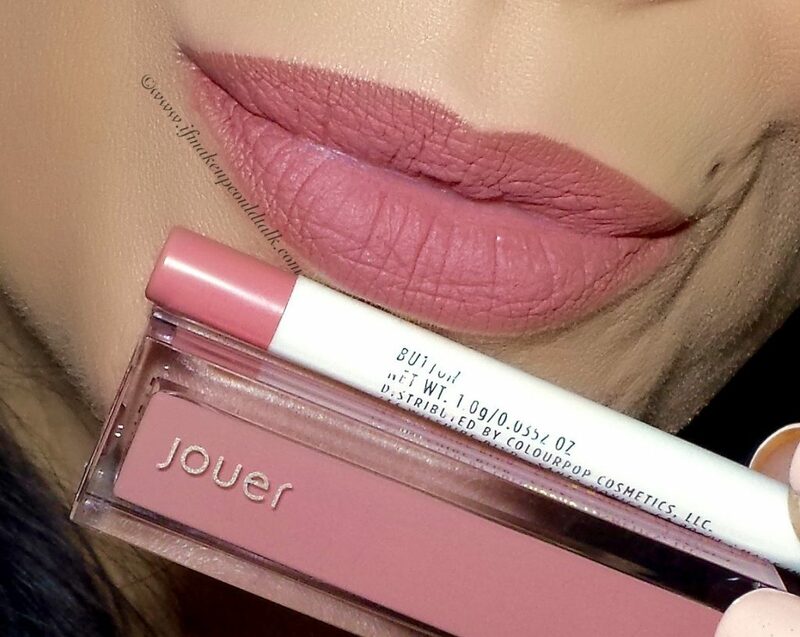 In general, I find Jouer’s lip cremes more appropriate for lighter beauties. The majority of their nudes are too stark against medium and darker skins. As proven, the addition of liners and such are required to make some of the colors work even on my olive complexion. 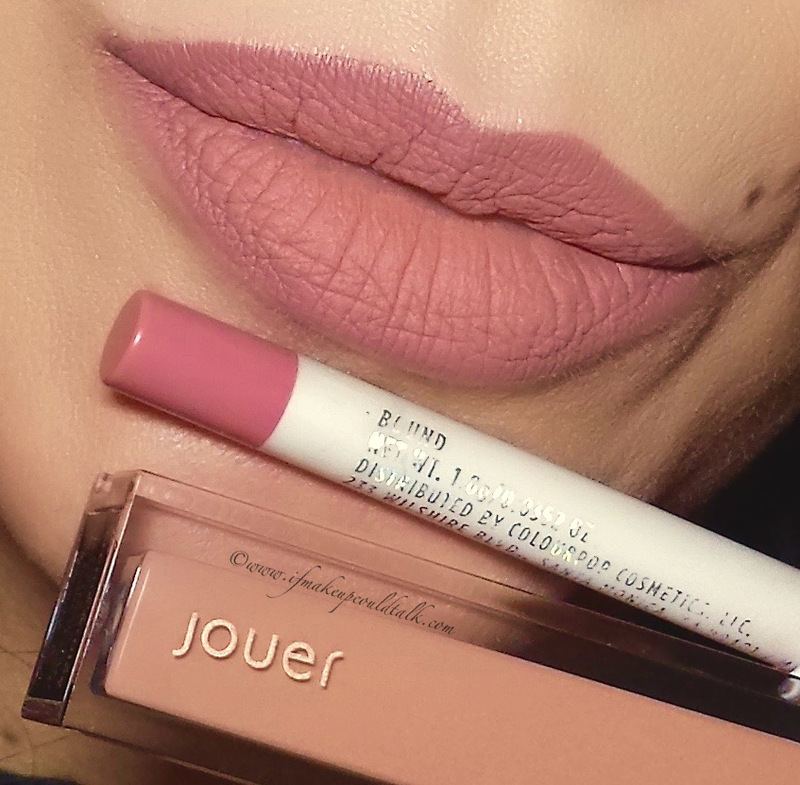 Despite all of the trouble, Jouer has an outstanding matte liquid lipstick formula that is creamy, comfortable, nontransferable and does not break down in the presence of glosses and other lipstick formulas. 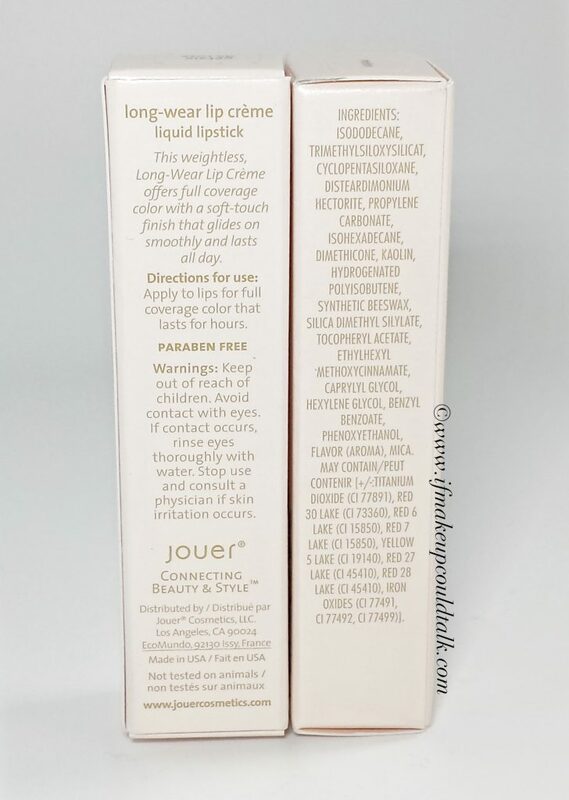 **Jouer Lip Cremes are paraben and mineral oil free, made in The USA and can be purchased on Amazon.com, jouercosmetics.com and joyus.com. 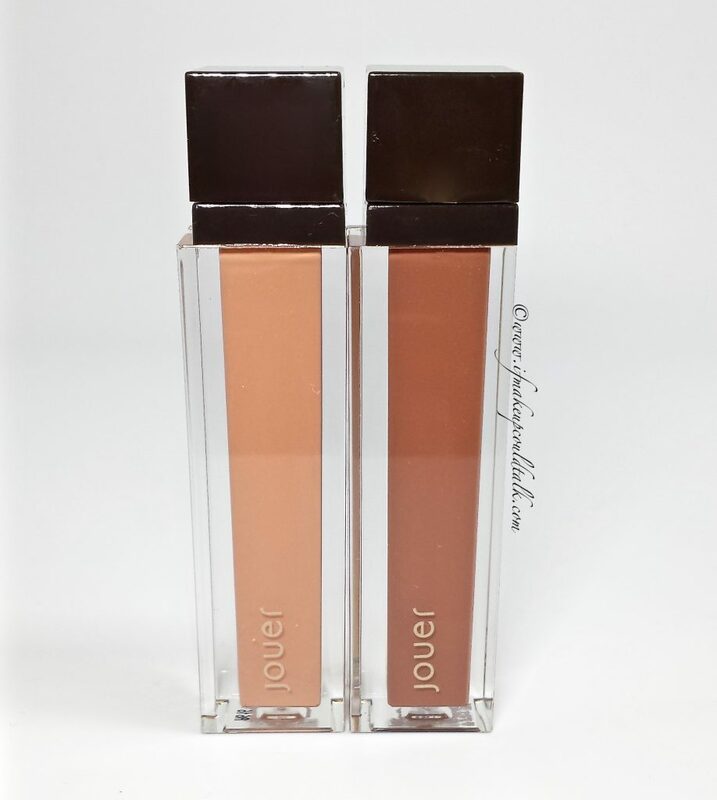 Makeup would tell you Jouer Lip Cremes are totally worth getting–if you are able to find a shade to suit your coloring. The price, amount offered, packaging, non-transferable aspect, comfort level, creaminess and compatibility with other formulas/brands is all encompassing. Which of the sixteen colors appeal to your palette? Until next time, be well, stay safe and be happy.